My bags came out perfectly. Highly recommend this company to all. Thanks Custom Earth Promos. So many colors to select from. Love how these bags are reusable and eco-friendly. Thrilled with how our bags came out. Showcased them at our annual event and everyone loved them. Custom Earth Promos was really patient with me. The guided me to exactly what I wanted. Fantastic company to do business with. I purchased 4,300 bags in a bulk order thru Custom Earth Promos. Best business decision I could've made. Working with this company was easy and affordable. I needed an order of 3,000 bags in a matter of weeks and Custom Earth Promos filled my order and had them delivered in time. Really pleased with our bags! They have a really polished and professional look. We love the colors of this bag and its overall quality! We've given out a couple hundred of these to our customers and they seem to love them as well! When I received the bags in the mail, I was shocked at how perfectly the order came out. From the logo to the quality of the bags, Custom Earth did a marvelous job! Our company's logo came out fantastic on this bag! Also, I love all the colors that are offered - it's tough to pick between!! 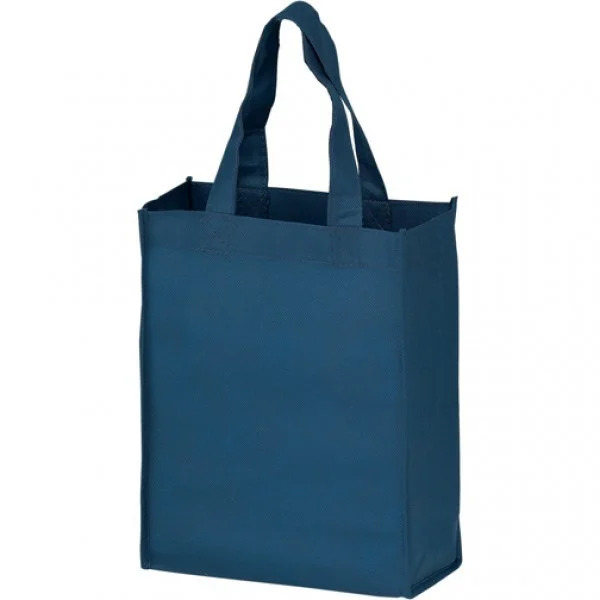 Purchasing a 100% recycled bag is fulfilling for our company that maintains an eco-friendly mentality. My clients love these bags! So glad we found an eco-friendly option for our business. 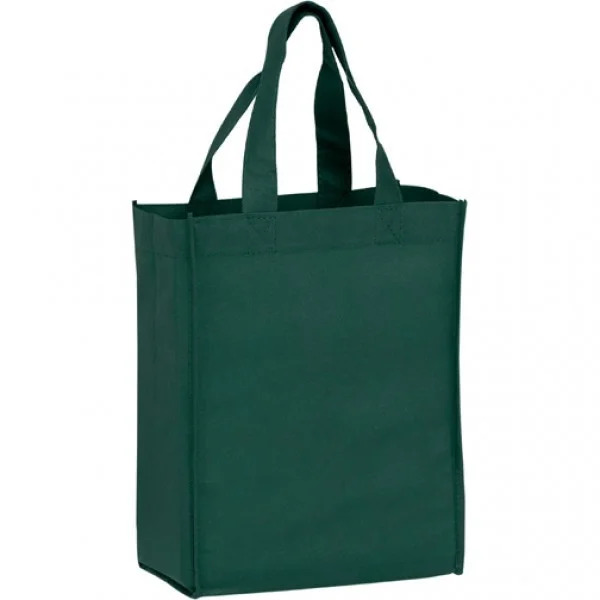 We are extremely impressed with the overall appearance of our bags. 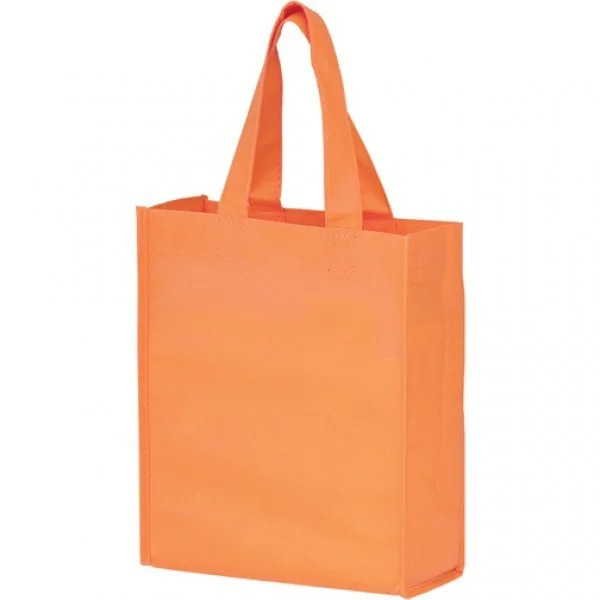 They make the perfect promotional gift bag! Thanks CEP for providing us with the perfect promotional product! I love these bags! They are the perfect size for us and are high quality as well! Our brand looked great on these earth-friendly bags. What a great, cost-effective way to improve our companies exposure. Just received our order and are so impressed with the quality and look, thank you CEP! Superior customer service. Made ordering so many bags a very simple process. A cost effective way to market our company. 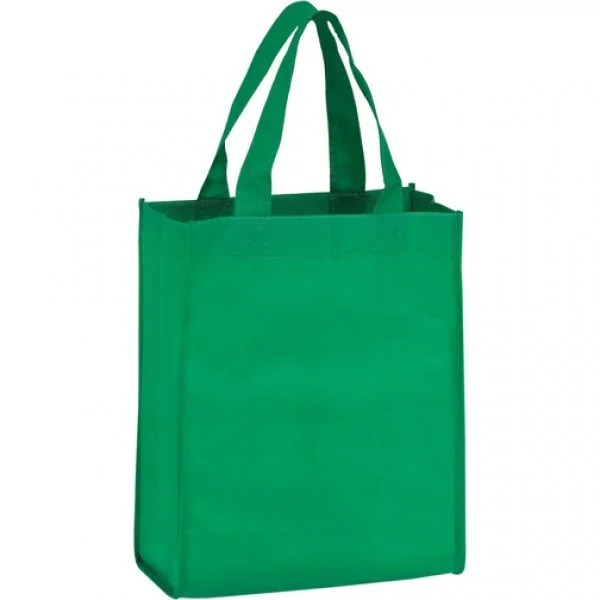 We received a considerable discount for ordering so many eco-friendly bags. Really great when your working with a budget and want a quality product. We customized these eco-friendly non-woven bags for an upcoming convention. I really feel confident that using these as a promotional tool will strongly benefit our sales. I truly use this bag for so many different things. They are great every day bags. 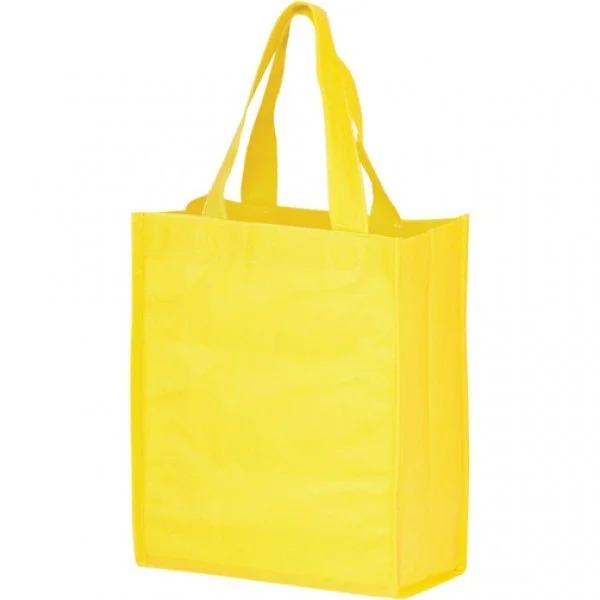 The reinforced stitching makes a huge difference in the durability of these bags. 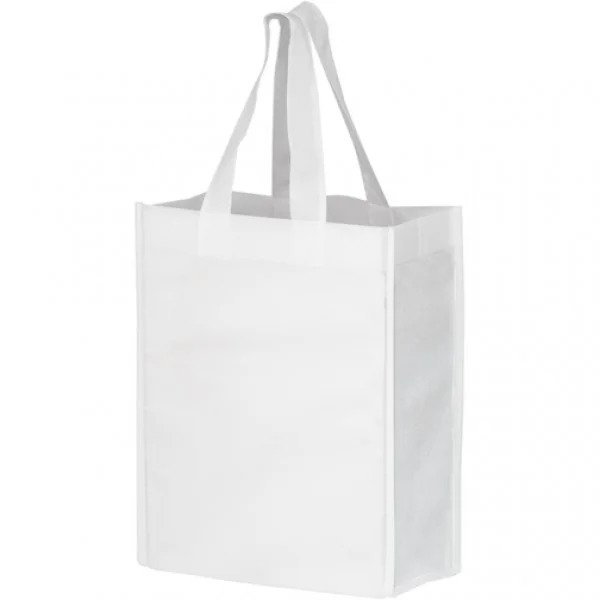 I highly recommend looking into these earth-friendly non-woven bags. PP16 is my favorite. We figured adding these bags to our marketing campaign would make a difference. It did. We gave them out to a lot of different people and that helped our company name to circulate throughout the community. We are so happy with our order! The look and feel of these bags is fantastic! We ordered 10k of the earth-friendly custom bags for our facility. They get a ton of use and really have a great look to them. 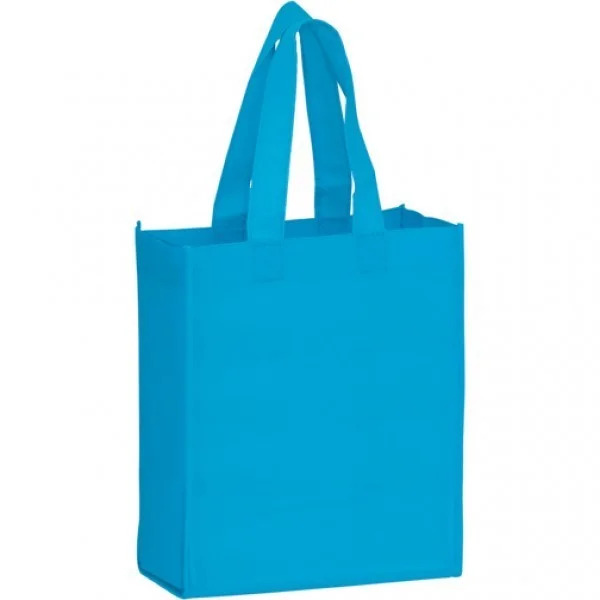 Let this promotional gift bag impress its users with high-quality construction and vibrant colors, while also doing you a favor by advertising your brand, cause, or event details with each use! 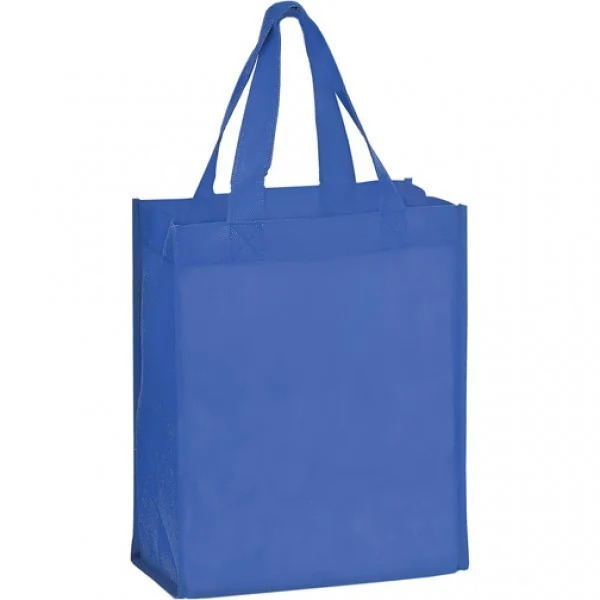 Popular at doctor's offices, weddings, rental communities, and more, our classy custom bags can also be used for smaller-sized retail purchases. 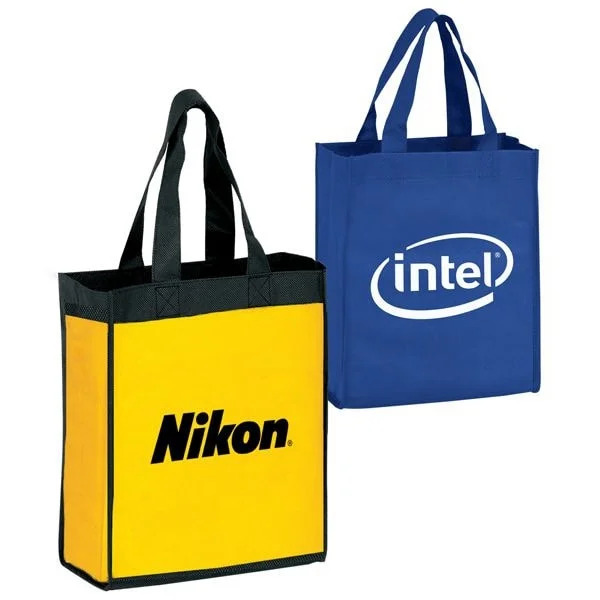 A great size for smaller items, our non-woven bags have countless uses and is a sophisticated way of advertising your brand. Choose from the available 15 in-stock color options to coordinate with any color scheme, and showcase your eco-awareness in style! Made from 80 GSM, earth-friendly (recycled & recyclable) non-woven polypropylene, the convenient size of these promotional totes can easily replace hundreds of disposable plastic bags in its lifetime. 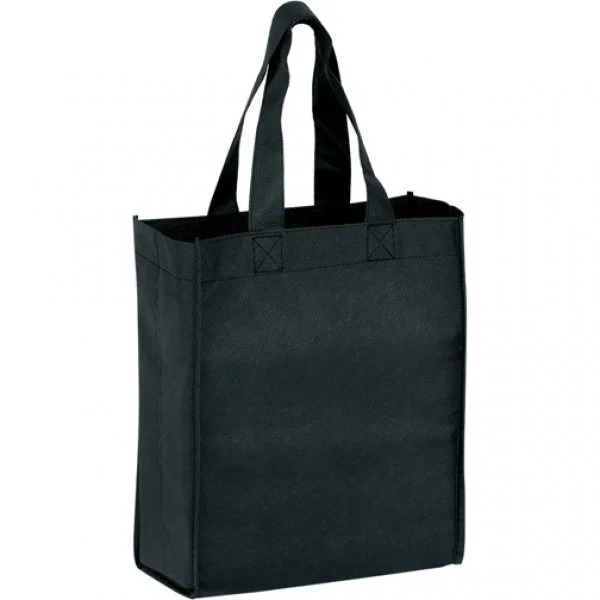 To make these wholesale reusable bags, we start with premium fabric stitched together with reinforced handles and seams to create crisp sides and bottom gussets. The final product is polished off with your bold, beautiful custom logo. 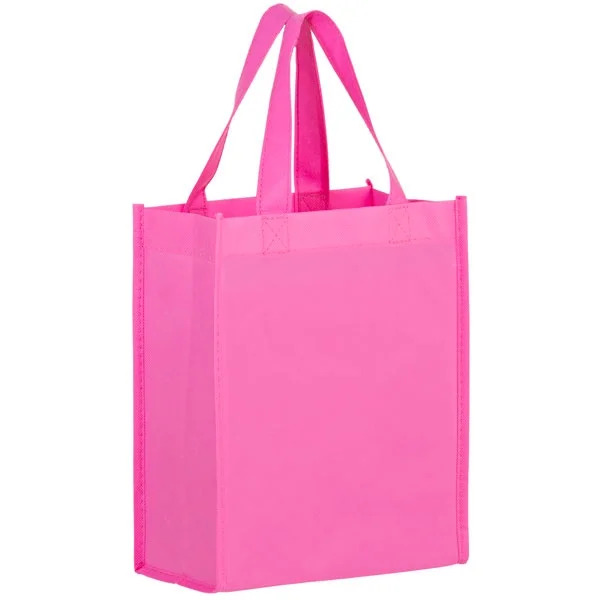 The 6" W x 6" H imprint area covers a large portion of the bag's surface to ensure your message can be seen even from across the room! 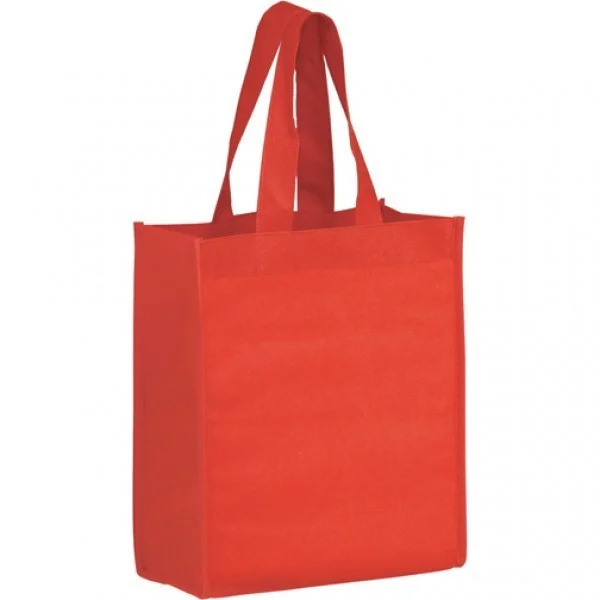 These non-woven bags are in-stock and ready to ship in over a dozen color options. With over 30 imprint colors in our collection, you've got options to decorate your reusable bags with your unique touch. 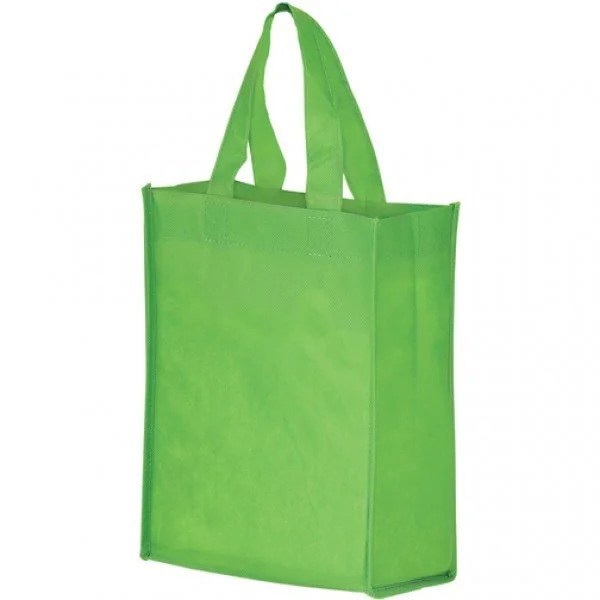 Whatever the occasion - charity ball, sports outing, family reunion, or golf tournament - your custom reusable bags are sure to turn heads and make your business look eco-smart. 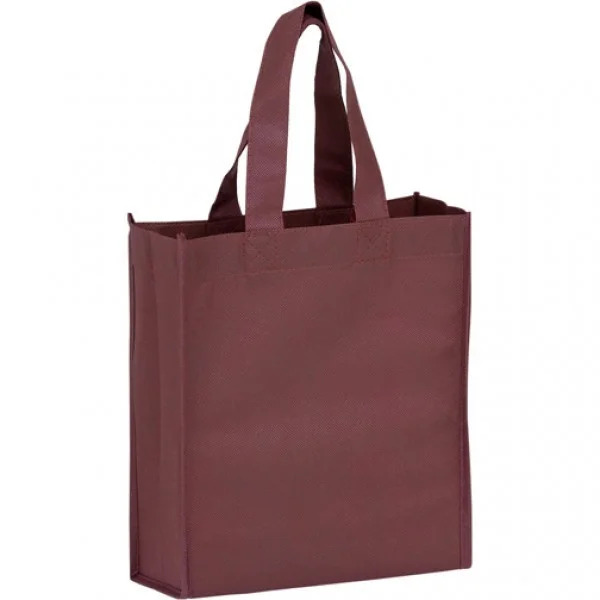 Give these little promotional tote bags an upgrade by ordering them overseas, complete with a FREE accent trim and handle color of your choice! In addition, our overseas factory can expand the standard imprint area to increase your logo size at no additional cost, or add multiple colors to your logo for a fraction of the price it would cost to do so domestically. All overseas orders come with unlimited creative art services; artwork modifications, custom design conceptualization and implementation, and virtual images. 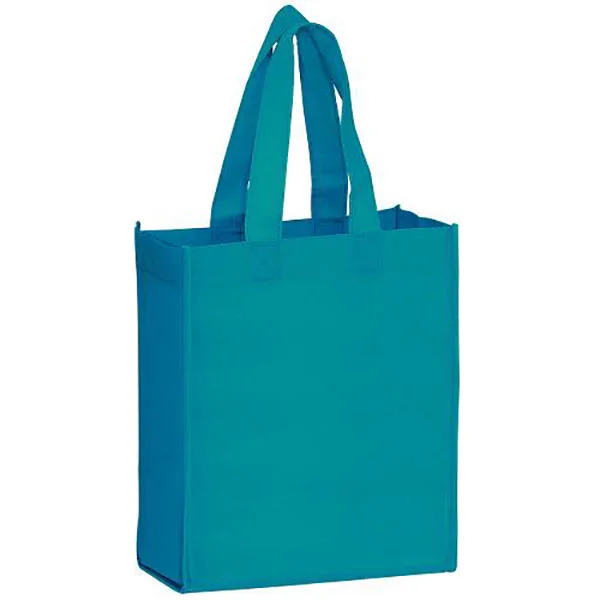 Based on your needs, we can alter the bag or handle dimensions, adjust the material thickness or add lamination, or accessorize your bags with snaps, front or side pockets, button closure, grommets, rhinestones, and more! Custom Earth Promos is committed to providing you with a seamless ordering experience from concept to finished product. We consider the needs (and budgets) of our clients, and strive to give you the best prices, products, and customer service in the industry.